Oregon City, located southeast of Portland, is one of the most historic cities in the state. Dr. John McLoughlin, of the Hudson Bay Company, founded the town in 1829. Starting in 1843, it was the end of the journey for many traveling the Oregon Trail. In 1844, because of this settlement, it was the first town west of the Rocky Mountains to incorporate. It served as the seat of Oregon’s Provisional Government in 1845 then was home to Oregon Territory’s first capitol from 1848 until 1851. 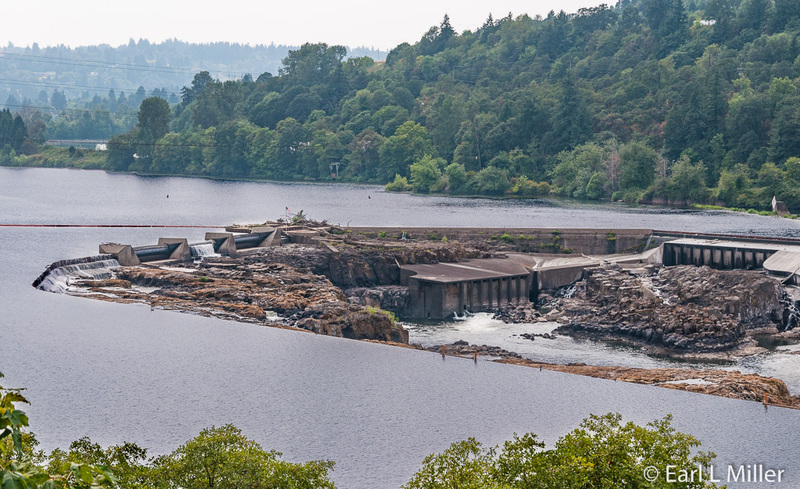 Built at the site of Willamette Falls, second only to Niagara Falls in volume of water flow, the town used this water power to industrialize with paper and woolen mills. 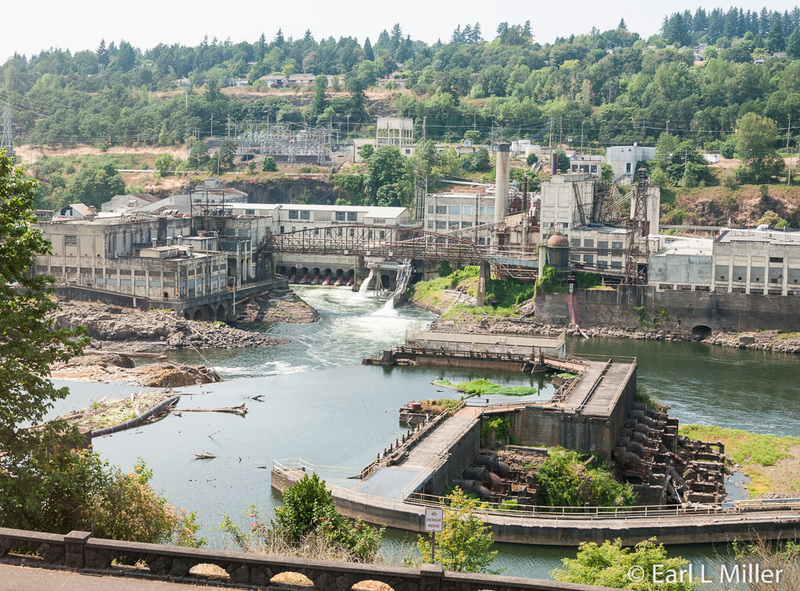 On June 3, 1889, dynamos at these falls created the first long distance electrical power transmission in the world - from Oregon City to Portland. Navigating past the falls was not possible until the completion of the Willamette Falls Locks on November 1, 1873, opposite the banks at West Linn. It was the first such navigation feature in the United States. The United States Army Corps of Engineers purchased the locks in 1915. They are now on the National Register of Historic Places. To understand this history, a visit to this town should include stops at End of the Trail Interpretative Center and the Museum of the Territory. I also suggest a tour of the McLoughlin House and a drive by the Ermatinger House. Finally, you might want to take the Municipal Elevator. Oregon City is built on two levels, and the elevator is the only vertical street in the United States. It leads to the McLoughlin Promenade and a great view of the falls. This museum is located on Abernethy Green, a site often identified as the end of the Barlow Road portion of the Oregon Trail. 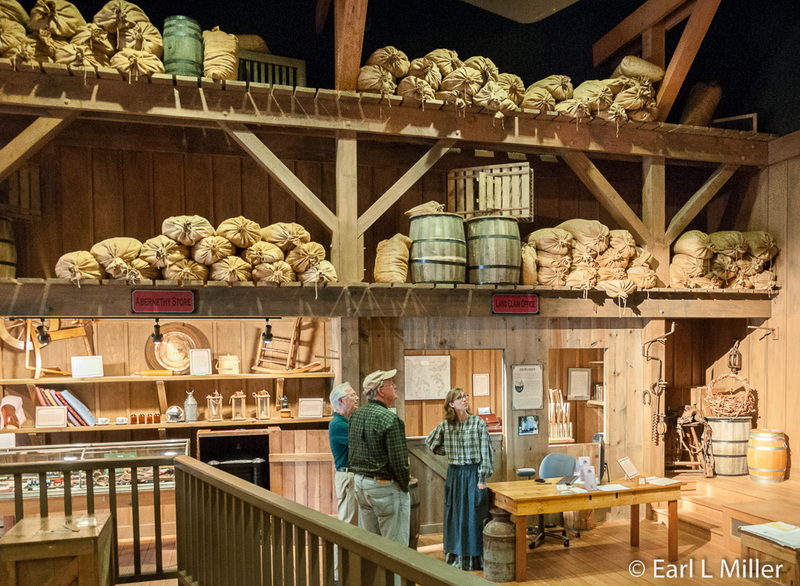 Through interactive exhibits, a movie, and living history, the story of preparing for the Oregon Trail, the passage itself, then what happened to these settlers after their arrival is told. 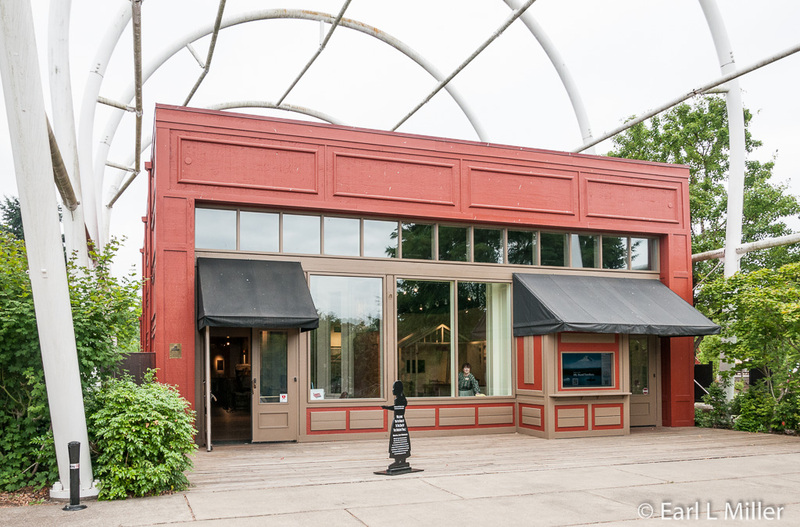 Start your visit at the visitor center where you purchase tickets to the museum, obtain free travel advice brochures from the state welcome center, and shop at the Country Store specializing in Oregon products. The store also features a selection of lunches and snacks including smoked salmon, cheese and crackers, and fresh local fruit. You then walk over to museum housing the End of the Trail exhibits. You’ll find four areas to discover. In each, you find interpreters eager to explain what you’re seeing and answer questions. In the first section, we saw an example of the type of wagons they used on the trail. They didn’t use the Conestoga wagons pictured in Hollywood movies. They used smaller wagons which were limited to between 1500 and 2000 pounds for all their goods. They had to take everything they needed: food, material to build houses such as nails, clothing, furniture, etc. The trail became littered with valuables such as pianos and treasured household goods which settlers discarded as they traveled the long 1,932 mile route. With loaded wagons, everyone walked unless they were wealthy and took a buggy along as well. These were pulled by at least four oxen. That was because oxen weren’t picky eaters, could pull plows once they arrived, had the right temperament, and would have had to been replaced by twice as many mules or horses. Their milk cows followed behind these wagons. 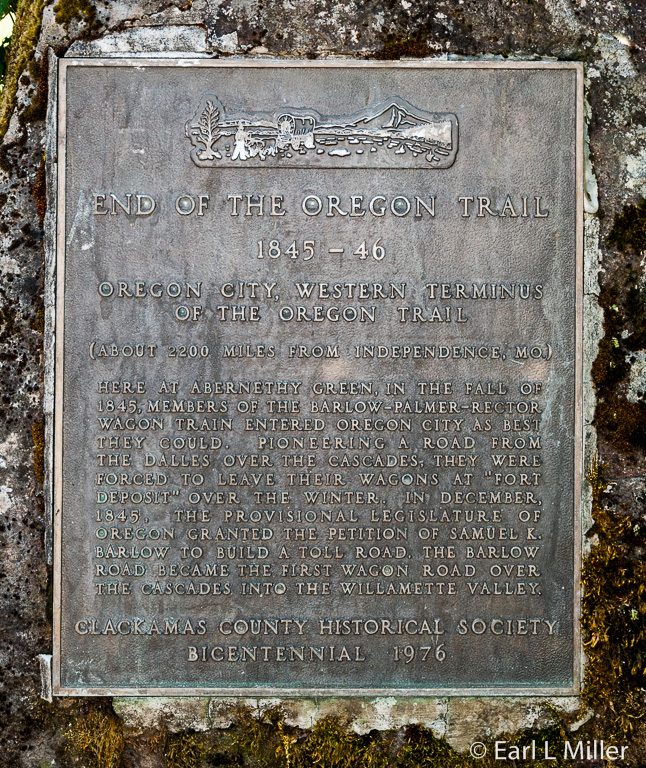 We learned 50,000 came west, with most traveling over the Oregon Trail, starting in 1843 when 875 arrived the first year. The end was the most arduous. They could ford the Columbia River, travel over the Barlow toll road, or take a southern route, the Applegate Trail, which was the long way around. This leads to an excellent 28-minute film “Bound for Oregon” on the lives of five who traveled the Oregon Trail. What I found special about the movie was the use of two projectors. One was the film while the other was almost like a hologram figure of John McLoughlin talking occasionally to the audience. It was extremely well done. The final exhibits, Here at Oregon City, deal with the Clackamas Indians, a slide show on those five pioneers portrayed in the film, and some of the occupations which settlers enjoyed once they reached Oregon City. The Confederated Tribes of Grand Ronde put together the exhibit on the Clackamas Indians for the museum. It covers the traditional food they grew and weaving. The slide show gives detailed information about the film’s five settlers, including eleven year old, Lucy Henderson, and Elizabeth Dixon Smith, who kept one of the most respected Oregon Trail Diaries. It also relates the biographies of John McLoughlin; Joel Palmer, Indiana and Oregon legislator; and John Minto, an Englishman who started the Oregon wool industry. While touring this section, Earl and I had a wonderful surprise. Gail Yazzolino, the museum’s director, had arranged for former mayor Doug Neeley of Oregon City to come and meet us. He portrays the role of John McLoughlin at some of the city’s special events. He told us the complete biography of “The Father of Oregon” and related his role in developing Oregon City. While Chief Factor and Superintendent of the Columbia District (Oregon Country) at Hudson Bay Company, McLoughlin made it easier for American settlers by supplying seed and credit. He had first claimed land in Oregon City in 1829 when he platted and named the town. After resigning from his posts, in 1846, he operated a gristmill and sold food and farming tools at his Oregon City store. In 1851, he was mayor. Finally, in this section, you will note a street of stores. 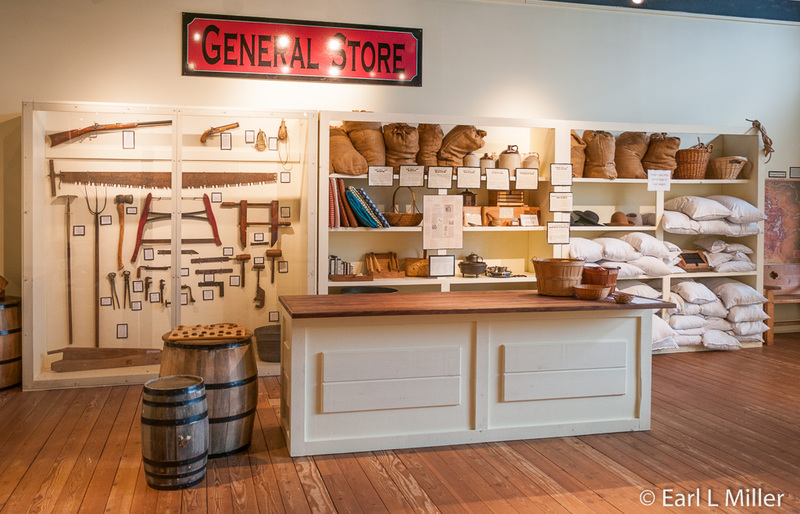 It consists of a Doctor of Shoe Repairs, George Abernathy’s stocked mercantile center, and the government land claim office. What is wonderful about this museum is the breadth of interactive exhibits. 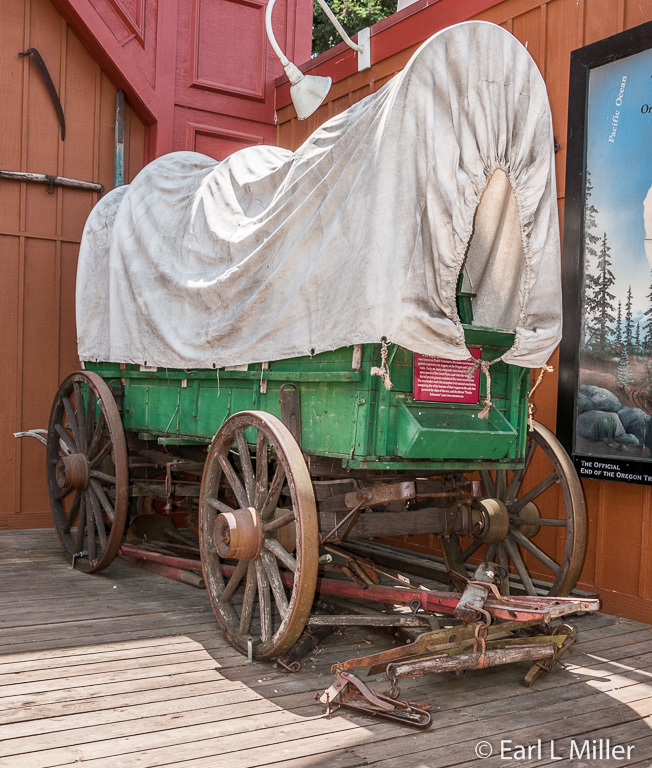 The objective is to have enjoyable activities for all ages and the emphasis is on “Do touch.” Visitors are allowed to sit at school desks, decide what to take in their wagon, and actually load a wagon. Youngsters are sometimes invited to play period games or participate in crafts like candle dipping or making a rag doll or journal. We visited the Heritage Garden outside which houses a variety of crops. The museum has speakers at the garden twice a month who talk about everything from potpourri to how to attract pollinators. Look for the sign in the garden marking the site of the end of the actual Oregon Trail. End of the Trail is located at 1726 Washington Street and the telephone number is (503) 657-9336. Hours are Sunday 10:30 a.m. - 5:00 p.m., Monday - Saturday 9:30 a.m. - 5:00 p.m., with the last admission into the interpretive center one hour before closing. Admission is $11 for adults, $9 for seniors, and $7 for children, free for ages three and under. This second floor museum gives a time line from prehistoric times through the town’s settlement in the 19th and 20th centuries. Through wallboards, photos, and artifacts it covers the Indians, fur traders, pioneers, industry, and merchants. 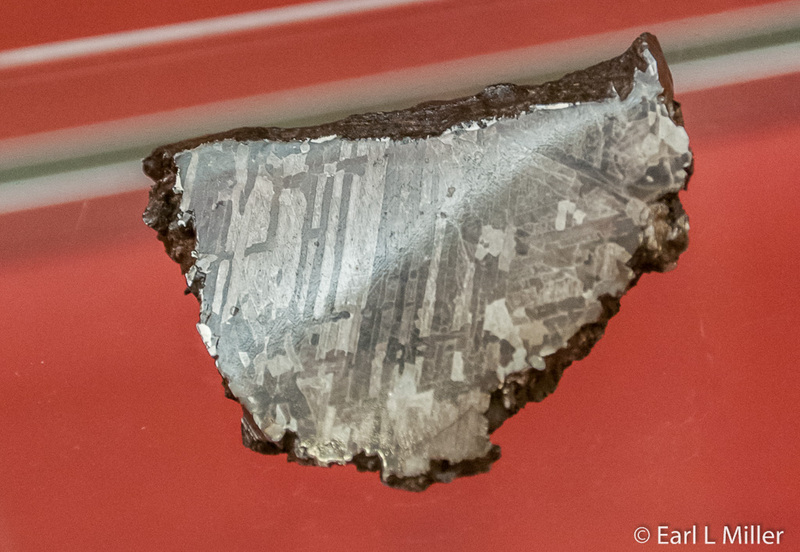 One interesting artifact in the Native American section is a piece of the Willamette Meteorite. The rest has been since 1906 at New York City’s American Museum of Natural History. The meteorite weighed 15.5 tons, the largest ever found in North America. It came from Canada/Montana and was washed into Oregon by the Missoula Floods more than 12,000 years ago. 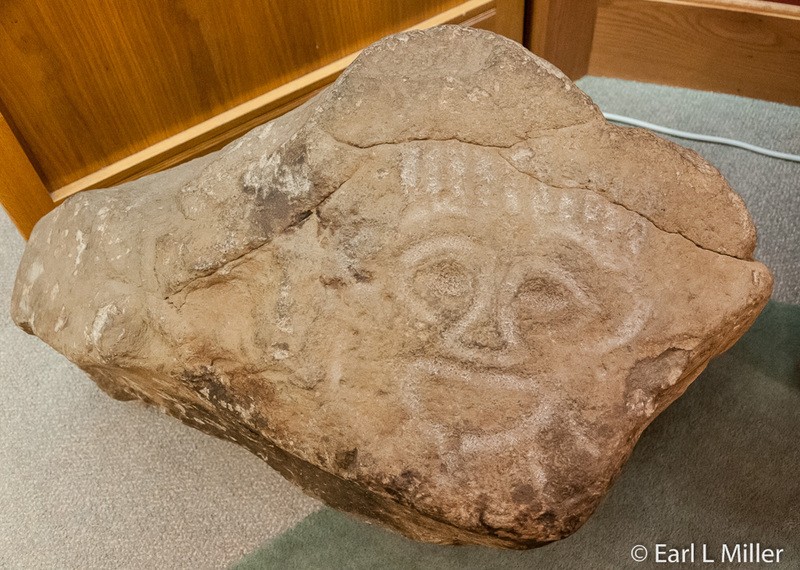 This area of the museum also has two petroglyphs. The one in the shape of a face was found in 1966 around Willamette Falls. The other, a much larger one, came from the Clackamas River’s confluence with the Willamette River. You’ll also see a case of arrow points as well as one of trade items between the tribes and American and British explorers. Next is the temporary exhibit on World War II in the Murdoch Gallery. 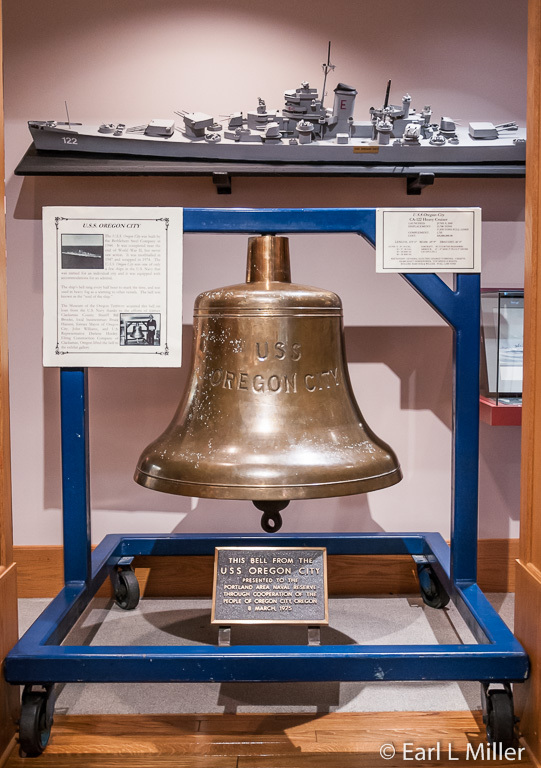 Here you’ll find a model of and the bell from the U.S.S. Oregon, a 1944 heavy cruiser. It never saw action and was scrapped in 1974. It was one of a handful of ships in the United States Navy named for an individual city. In this section, you’ll also see different branches of World War II uniforms and dioramas of the Battle of the Bulge and airborne operations. The settlement section houses several interesting artifacts. 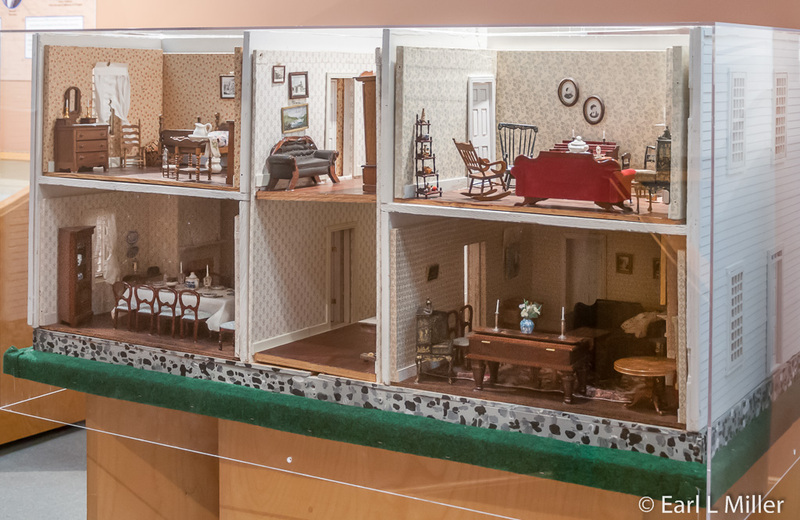 One is the dollhouse of the McLoughlin House. Like its namesake, it has four rooms upstairs and four rooms downstairs. 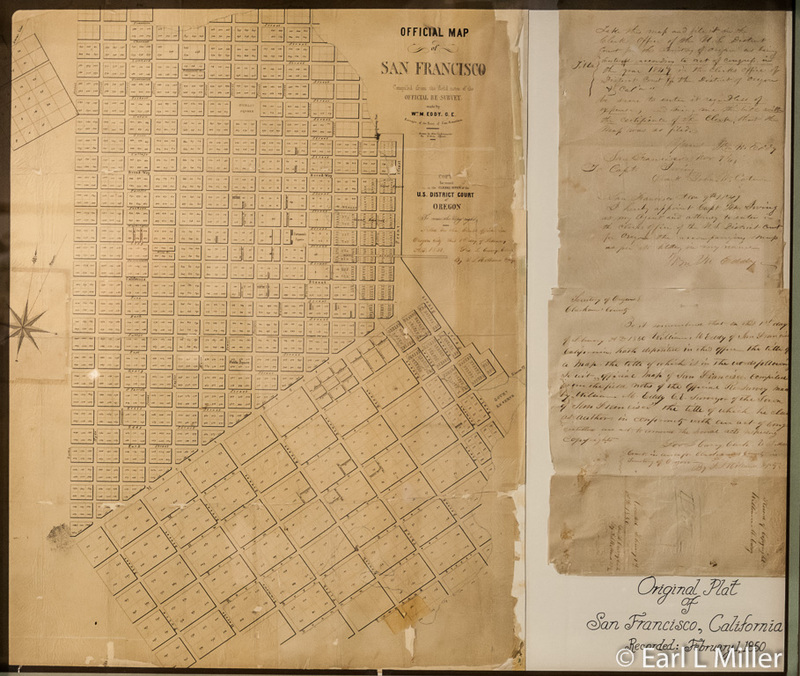 Others are original platted maps of Oregon City and the city of San Francisco, California. They have that because Oregon City was the only land office west of the Rockies. Another way settlers reached Oregon was going around the tip of South America and sailing up the coast. 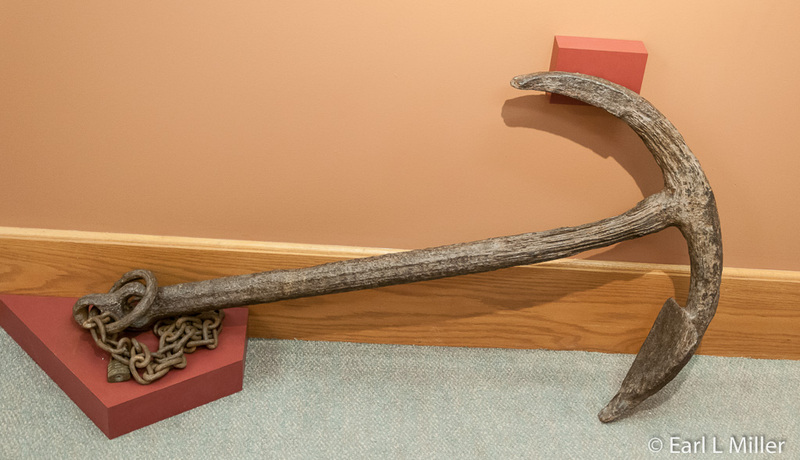 One such ship, the Owyhee, from Boston, had its anchor discovered in 1933. Native Americans had cut the anchor rope when the ship arrived without realizing that one of the crew members had malaria. That disease wiped out 90 percent of the natives. It’s easy to spot the 1909 buggy owned by Joseph and Elizabeth Young, who homestead in nearby Damascus in 1863. It’s typical of horse drawn carriages used by doctors to travel to patients’ homes. Wallboards focus on what happened to people who settled the territory providing such biographies as McLoughlin’s. The next section is on country life. You’ll see old school desks, a replica of a pioneer dress from the 1850's that you can touch, a farm wagon, and agricultural photos. It also contains a General Electric Hotpoint range circa 1922-1925 and an early manual washing machine. Particularly interesting is the tree branch found along Barlow Toll Road where you can actually see markings from ropes tied to it to lower wagons down a hill. The industry section provides information and photos on the town’s mills. Pendleton bought a lot of patterns from the Oregon City Woolen Mill, a factory which was one of the town’s mainstays. It made wool blankets and is touted on a museum wallboard as being the largest woolen mill west of the Mississippi River. The falls have been home to several paper mills. The Willamette Falls Paper Mills dated to 1866. It became the Willamette Pulp and Paper Co., which opened on the West Linn side during 1889. Although it is still open, its ownership has changed hands several times, including being part of Crown Zellerbach, and is now called West Linn Paper Mill. You’ll want to stop by the section on Portland General Electric to watch the movie on this company and the history of Oregon City. A river walk, planned for 2017, is being built through a public-private partnership including PGE, the property owner, city, state, METRO, and federal monies. One superb display is the intact Kaegi Family Pharmacy, moved from the Wilsonville Shopping Center to this museum, when the family retired. 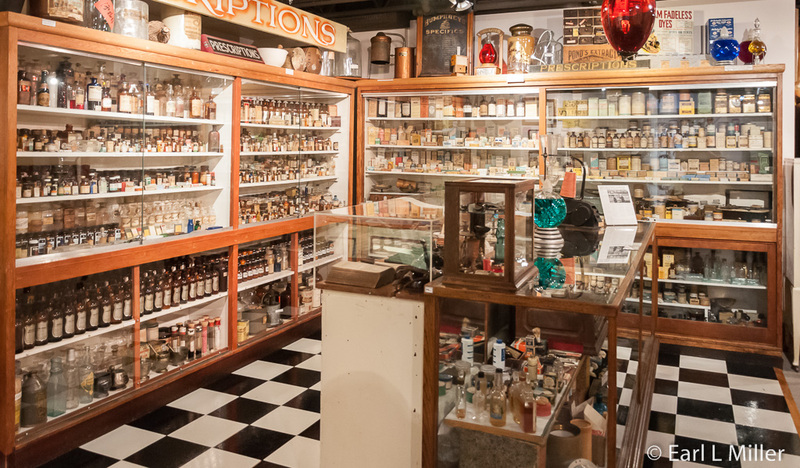 The pharmacy originated in Portland and operated for 68 years. A lot of the vials still have pills. Two bottles are even labeled placebos. In this section is a cabinet of old medical instruments. You’ll also find a 1000 K. A. dialysis machine manufactured in 1969. 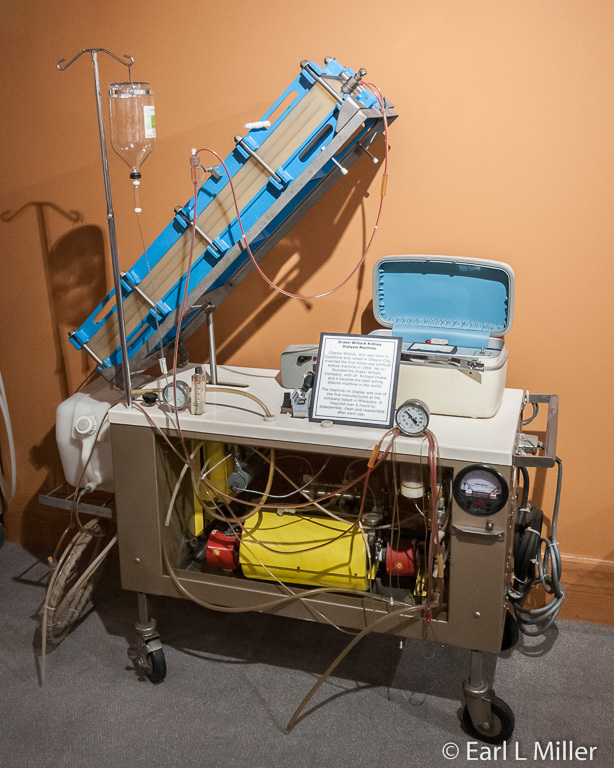 Charles Willock, from nearby Milwaukie, Oregon, invented this machine in 1964. He founded, with Dr. Richard Drake, the Drake-Willock Company. It is one of the best sold dialysis machines in the world. 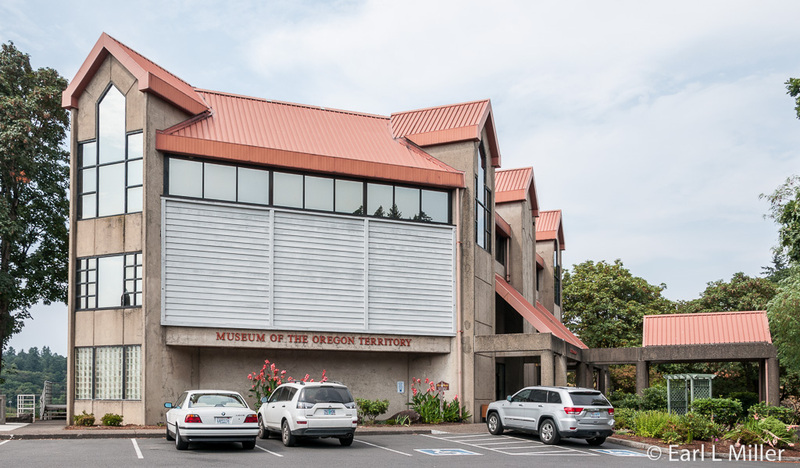 The Museum of the Oregon Territory is found at 211 Tumwater Drive, Oregon City. The telephone number is (503) 655-5574. Hours are Tuesday through Saturday 10:30 a.m. to 4:30 p.m. Admission is $5 for adults and $3 for ages 5-18. Though this house is now closed to the public, it is worth an exterior look because of its history. Francis Ermatinger was chief trader for the Hudson Bay Company and in charge of the Hudson Bay Store until 1864. 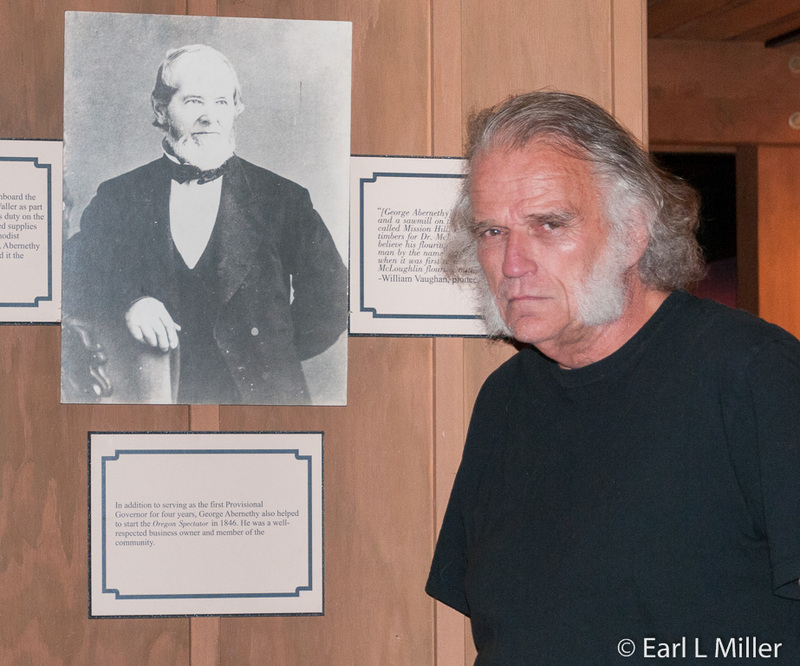 He along with Joe Meek (see Champoeg article) and Robert Newell brought the first wagons to the Northwest. 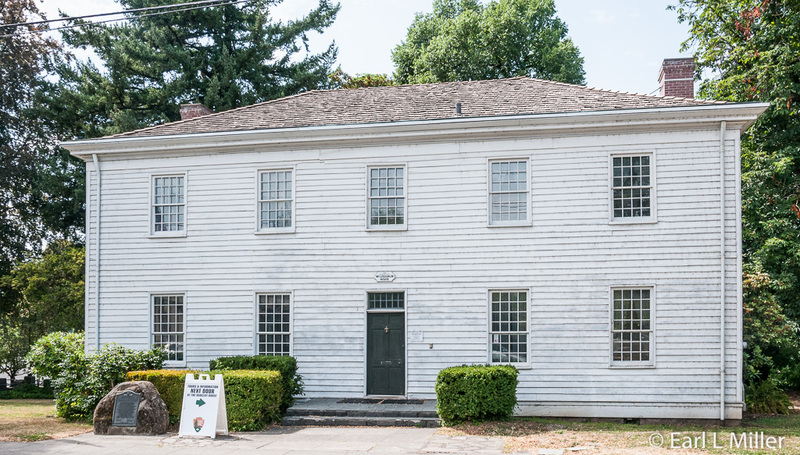 The house is the oldest residence in Clackamas County and the site of the coin toss which gave Portland its name. Portland was founded by Francis Pettygrove, from Portland Maine, and Asa Lovejoy, from Boston. Pettygrove came to Oregon by ship in 1842. He had been a successful merchant in Maine and continued this career running the Red House Store in Oregon City and a warehouse in Champoeg. Lovejoy, arrived in 1842, guided the Marcus Whitman party back east, then returned with the Great Migration in 1843, the wagon train said to have opened the Oregon Trail. In 1844, he built a log home on what would become the Portland waterfront. They platted their new city in 1845 and flipped a penny to decide its name. Pettygrove won preventing the town from being called New Boston. This home, built in 1845 and moved into in 1846, is now run by the National Park Service which gives free tours on Fridays and Saturdays from 10:00 a.m. to 4:00 p.m. at a quarter past the hour with the last at 3:15 p.m.. The tours last about 45 minutes to an hour. No interior photography is allowed even if you don’t use flash. I was told by the national park service this is because of security, but you can see interior photos on line. Tours begin next door at the Barclay House. Barclay was Hudson Bay Company’s physician in 1840. In Oregon City, he had various roles: mayor, school superintendent, first coroner in Oregon, and physician. The home was built in 1849 and remained in the Barclay family until the 1930's. It became part of the National Park Service in 2003 along with the McLoughlin House. It was also originally at another site. You’ll hear about the fur trade and the biography of John McLoughlin from his days with the Hudson Bay Company. You’ll learn that in Oregon City, he extended loans to immigrants to help them with their commercial ventures. His businesses included two sawmills, a grist mill, granary, general store, and shipping. He donated land for schools and churches. He died at his home in 1857. His grave and that of his wife’s are located between the two homes. After the family moved to Portland in 1957, it was sold to become the Phoenix Hotel. Then it became a boarding house for the Chinese laborers that worked at the Oregon City Woolen Mill. It was used last as a brothel before becoming a museum. The home was originally built on the lower level of the town. It was elegant for its time as most families lived in crude log cabins. It was built completely of finished lumber (local wood and prefabricated trim shipped from Boston). The first floor consisted of a large parlor, dining room, reception room (now a sewing room), and McLoughlin’s office. Upstairs consisted of three bedrooms and a sitting room. The hallway often doubled as a guest room. The kitchen was not attached nor were there any indoor bathroom facilities. All doors and windows were from England. When the park service acquired the home, it was in great disrepair. It still has the original siding, but some of the rear siding was destroyed in an arson fire in the 1970's. It was moved to the upper level of town, its present location, by using a capsam and one horse, eight inches at a time. It took the horse 60 hours with actual moving time. In 1909, this moving occupied the whole street and sidewalk. The move occurred to save it from being taken down by the Hawley Pulp and Paper Mill. The McGloughlin Memorial Association raised the money to move the building and to run it afterwards. 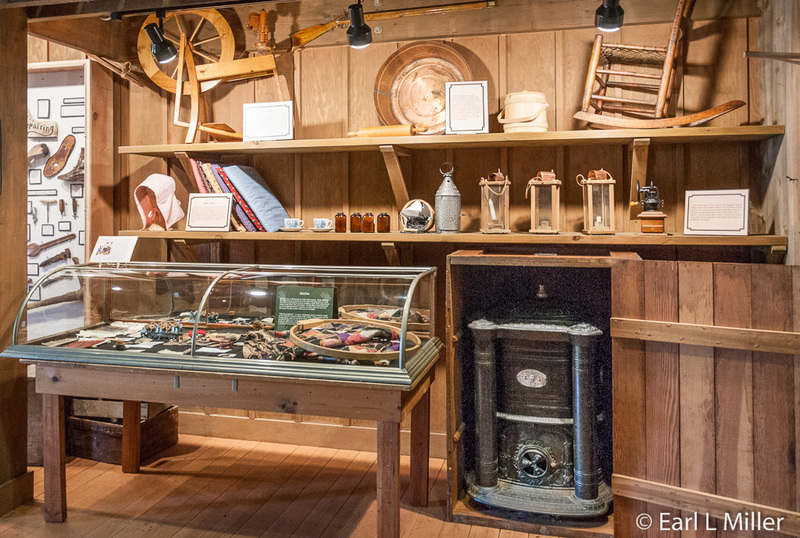 It started out as the Oregon Trail museum in 1909 as there were no McGloughlin items acquired until the 1930's. 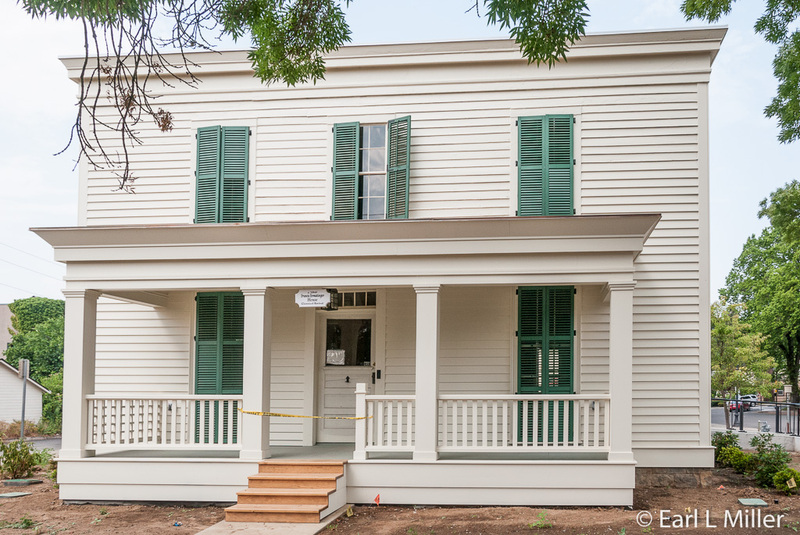 At that time, the home was slightly remodeled and reopened as the McLoughlin House Museum. 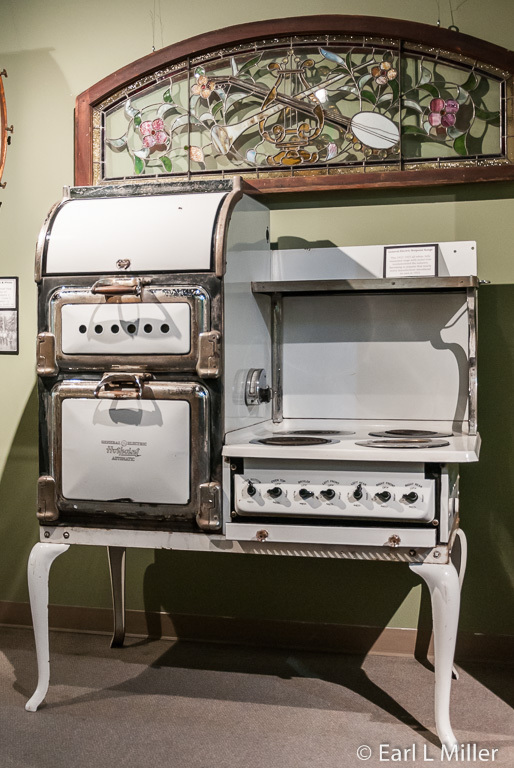 The museum acquired items by auction, donation, and from McLoughlin’s grandchildren. Most of the furniture is period as are the home’s artifacts. The dining room table and chairs, china, crystal, and silver belonged to the McLoughlins. The desk in the office was his and the Chinese sewing cabinet belonged to his wife. You will see a yellow fainting couch that was his in the bedroom upstairs. Other items that belonged to the McLoughlins are his watch, mourning ring, pins, Northwest Company seal and imprints, and pen holders. The McLoughlin home is located at 713 Center Street and the Barclay house at 719 Center Street. They are part of the Fort Vancouver National Historic Site. The telephone number is (503) 656-5146. In Oregon City’s early days, the town was mostly on one level. By 1867, instead of following Native American trails, the climb consisted of 722 steps from the cliff’s base to the bluff’s top. In December 1912, the town authorized the construction of an elevator from lower to upper town. After years of conflict and discussion, an elevator of steel and wood was finished December 3, 1915. The 89-foot ride to the top was a wheezing, jerking motion that took three to five minutes. Once passengers reached the top, they had to cross a 35-foot catwalk bridging the two sides of the city. It was run by water power or electricity. Sometimes it worked but when it didn’t, passengers climbed out of the trap door and down a narrow ladder. By 1924, hydraulic power replaced the water and reduced the ride to 30 seconds. It became dependable until the 1950's when breakdowns were much more frequent. In January 1954, a new design produced a bid of $116,000 within the authorized bond amount of $175,000. The new elevator was dedicated on May 5, 1955. The existing elevator is 130 feet high, and passengers zip to the top in 15 seconds. Passengers walk through a 35-foot tunnel loaded with early photos of Oregon City and the elevator. The ride has always been free and continues to be free. 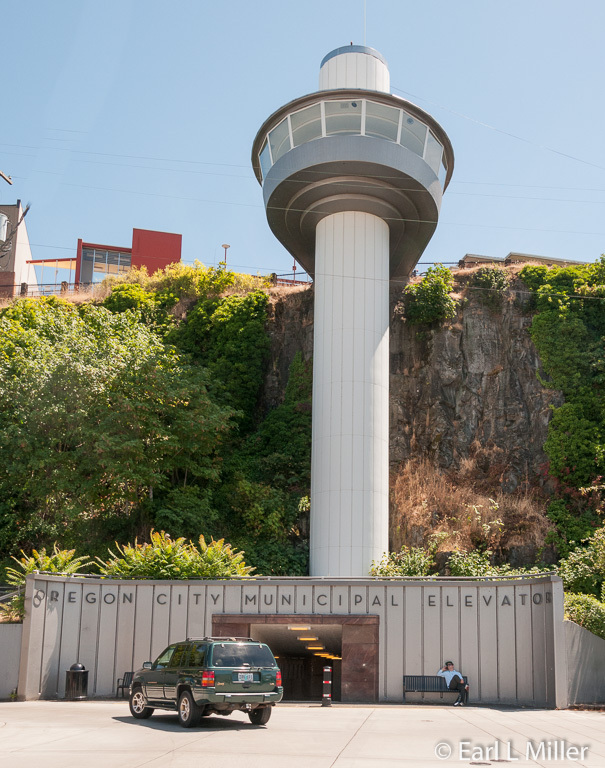 The Oregon City Municipal Elevator is one of only four municipal elevators in the world and “Elevator Street” remains the only “vertical street” in North America. The elevator always starts at 7:00 a.m. but closing times vary from 7:00 p.m. to 9:30 p.m. depending on the day of the week and season. It is located at 6 Railroad Avenue. The telephone number is (503) 496-1197. 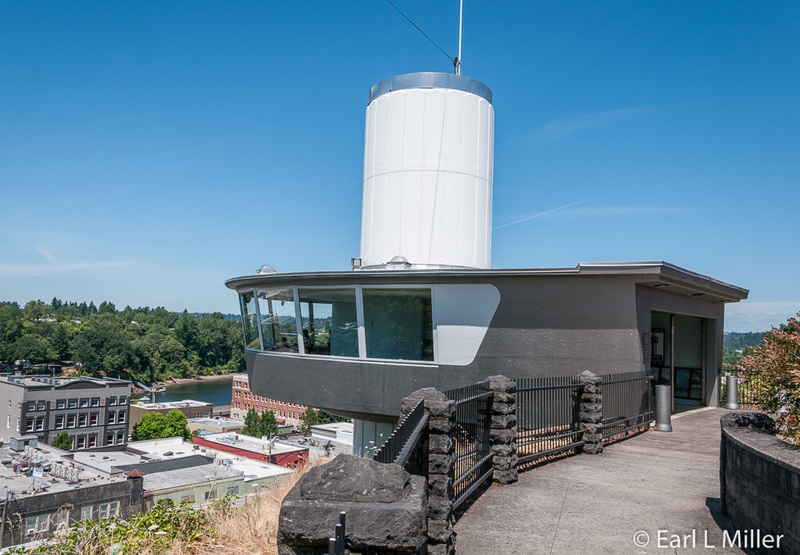 While on top, stroll along McLoughlin Promenade for great photo opportunities of Willamette River, Willamette Falls, and Oregon City.